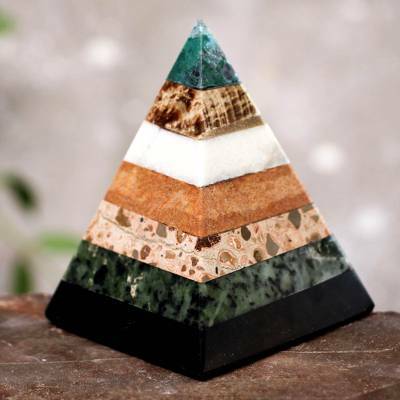 Hand Crafted Peruvian Gemstone Pyramid Sculpture, "Empowered"
Sculpted of semiprecious gems, the classic pyramid takes on extraordinary beauty. Cesar Gonzáles presents the polished statuette of black onyx, serpentine and chrysocolla. He adds aragonite and white calcite along with leopard jasper to this gemstone sculpture. 10.6 cm H x 8.6 cm Diam. 4.2" H x 3.4" Diam. You can find gemstone pyramid 'Empowered' by Cesar Gonzales in sculpture categories such as Geometric Sculpture and Health Sculpture. Enjoy exploring these sections for other Novica treasures. I ordered three pieces, two pyramids and the jade obeisk and I'm very happy with all three. The packaging was fantastic - no damage in shipping. They arrived safe and sound. The quality of this pyramid is outstanding. The colors are so vivid and have such depth. A friend saw mine and loved it so much that I went online and bought another to gift her.